Wasa 55 is “Original-Wasan” and the result of a collaboration between Harry Becker and Leif Ängermark. 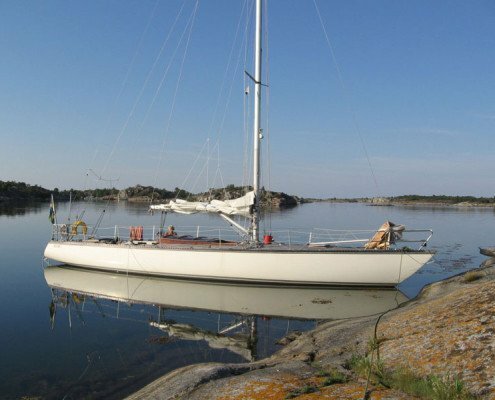 Some of the lines were borrowed from Harrys old “skärgårds 55” but equipped with modernities such as short keel and separate rudder. And Leif’s demands on performance and sailing performance were nothing to compromise with. The premiere in the 1975 edition of Tjörn Runt was successful, Leif’s boat Rangrök III came in first place on a record time of 4 hours and 40 minutes. That the 55 was both fast and successful was proved by also at the two following years at Tjörn Runt when a Wasa 55 was the fastest arround and in 1977 it set a new record time of 4 hours and 29 minutes, a time that stands still today. That the Wasa 55 had sailing performance well above avarage was also proven at the OSTAR, TWOSTAR and BOC Atlantic sail races. A total of 67 boats were built.